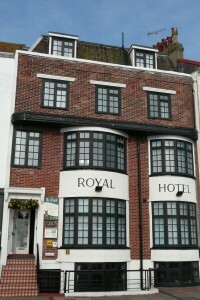 At The Royal all bedrooms are individually styled with comfortable beds and crisp, professionally laundered white linen. They all have private facilities with modern power showers and constant hot water. 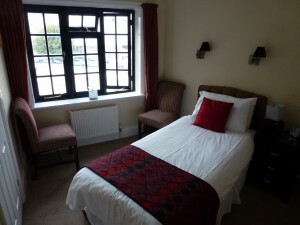 Each room also has a flatscreen television with Freeview channels, radio alarm clock and hairdryer for your convenience. Most of our rooms have spectacular direct sea views and every room has a hospitality tray with complimentary tea and coffee making facilities. Bathrooms are fresh and modern with heated towel rails, shaver points, fluffy white towels and a range of complimentary toiletries. Instant Online Booking: simply choose your favourite room from the photos below, then click the ‘Book Online’ button on the right of this page (or below if you are using a mobile device) to check availability and prices. You will be transferred to our secure booking page and will receive instant confirmation of your reservation. For special offers or any queries, please telephone us on 01323 649222. Room 2 (below) Newly decorated sea view room on the first floor with modern shower en suite. 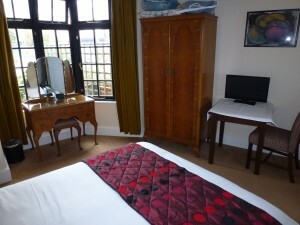 Flatscreen multi-channel TV, tea & coffee-making facilities, radio alarm, hairdryer and WiFi internet. 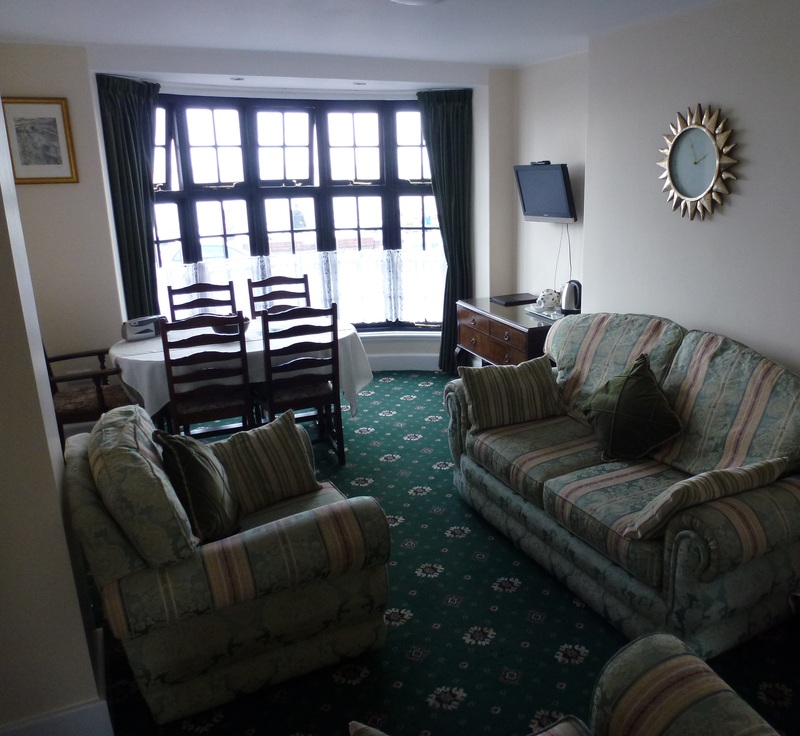 This room has a sitting area in the bay window overlooking the beach. Non-smoking. 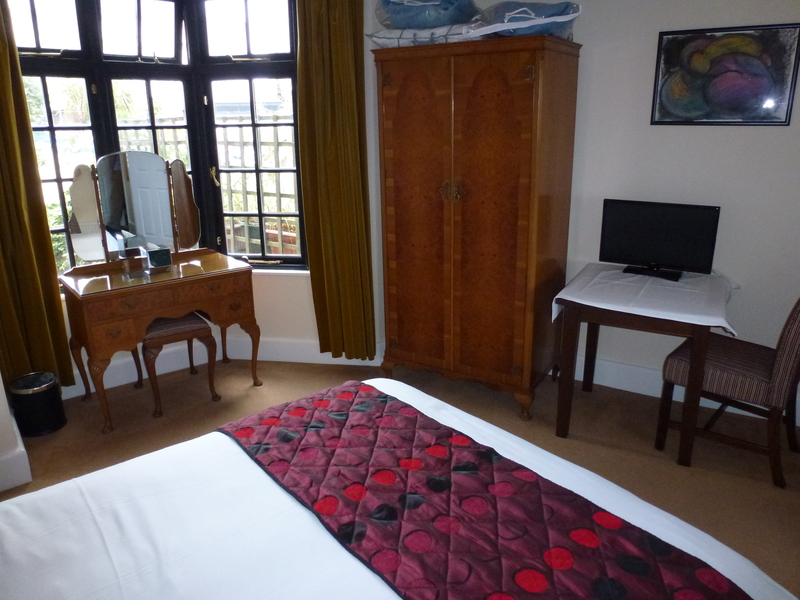 Room 3 (below) Newly decorated rear double room on the first floor with modern shower en suite. Flatscreen multi-channel TV, tea & coffee-making facilities, radio alarm, hairdryer. Non-smoking. Room 4 (below) Newly decorated double room on the first floor with sea view with modern shower en suite. Flatscreen multi-channel TV, tea & coffee-making facilities, radio alarm, hairdryer. Non-smoking. Room 5 (below) Newly decorated rear single room on the second floor with modern shower en suite. Flatscreen multi-channel TV, tea & coffee-making facilities, radio alarm, hairdryer. Non-smoking. Room 6 (below) Newly decorated single sea view room on the second floor with modern shower en suite. Flatscreen multi-channel TV, tea & coffee-making facilities, radio alarm, hairdryer. Non-smoking. Room 7 (below) Newly decorated rear single room on the second floor with modern shower en suite. Flatscreen multi-channel TV, tea & coffee-making facilities, radio alarm, hairdryer. Non-smoking. Room 8 (below) Newly decorated twin sea view room on the second floor with modern shower en suite. Flatscreen multi-channel TV, tea & coffee-making facilities, radio alarm, hairdryer. Non-smoking. Room 9 (below) Newly decorated spacious sea view single room on the third floor with its own modern private facilities. The private shower room is just a step across the landing. Flatscreen multi-channel TV, tea & coffee-making facilities, radio alarm, hairdryer. Non-smoking. Room 10 (below) Newly decorated double sea view room on the third floor with modern shower en suite. 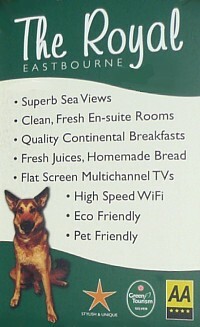 Flatscreen multi-channel TV, tea & coffee-making facilities, radio alarm, hairdryer. Non-smoking.